Let's talk about how Cairn works. How do I get started? The first step is to sign up for the monthly or quarterly subscription box. A box will arrive right at your door each period, starting with the month you sign up in. What comes in the box? Each month you'll receive a box of products catered to your interest. 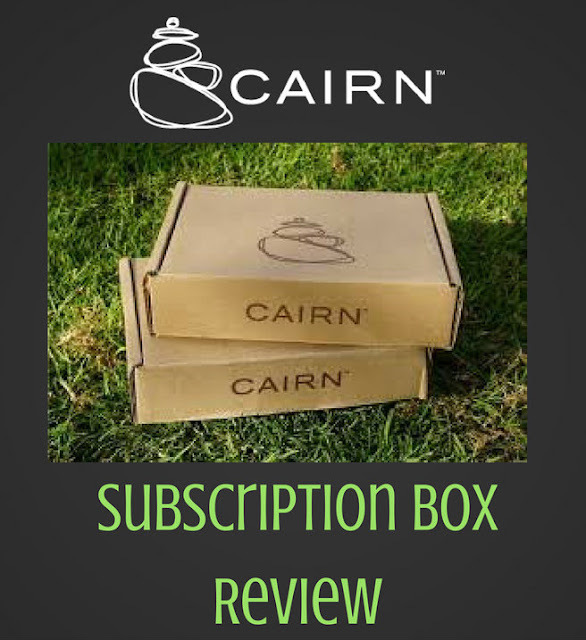 Cairn works hard to include innovative products that appeal to outdoor lovers. There are 5 categories you could receive a product for: gear, apparel, food/energy, skincare, and emergency/medical. Can I buy just one box or send one box as a gift to test it out? Yes! 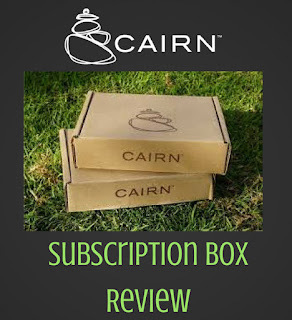 Just click on Cairn's GIFT tab and select 1 box. Can I pick exactly what goes in my box? 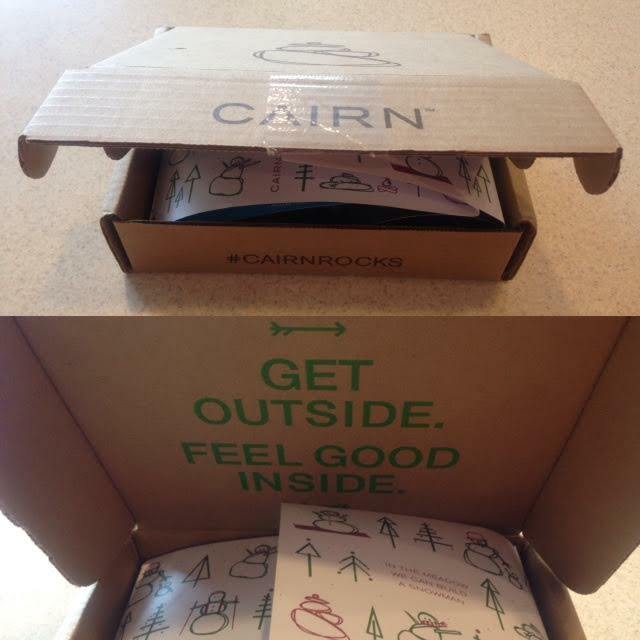 Simple answer is no, that's what makes Cairn a "discovery" box! Here's what came in my first box! Opening my first Cairn box! Stoke level was high! 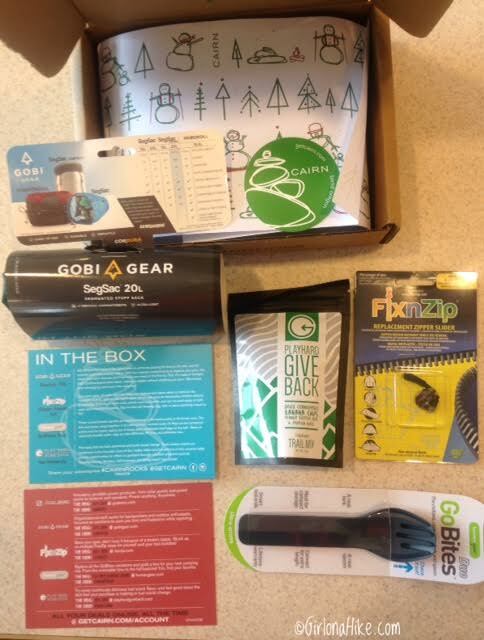 Gobi Gear makes organizational stuff sacks focused on solutions to save your time and frustration while exploring. 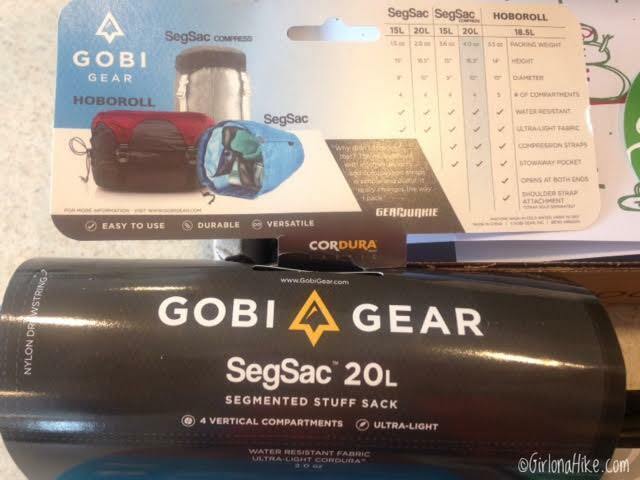 The Gobi Gear SegSac 20L has four internal compartments to organize your gear. 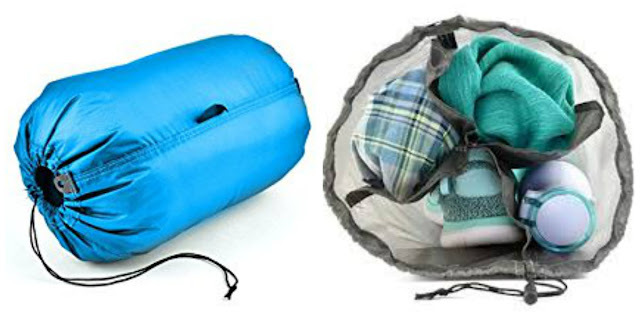 Efficiency is key when trimming down your packing time on the trail or road trip - why not start with this UL stuff sack? At only 2.0 ounces, this portable bag rolls up to fit down to the size of my fist. I see myself using this for the gym too - a great place to put my shoes, towel, headband, and water bottle. You could even use it on road trips for the kids - it would fit a small book, stuff animals, snacks, and maybe a card game. It wouldn't be ideal for hiking, as there are no shoulder straps - there is only one handle on the bottom of the pack. 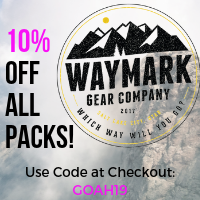 You can purchase Gobi Gear on Amazon. This one had me at "peanut butter cups." Not only should you eat this mix in the mountains, it was made in the mountains in Sun Valley, Idaho. 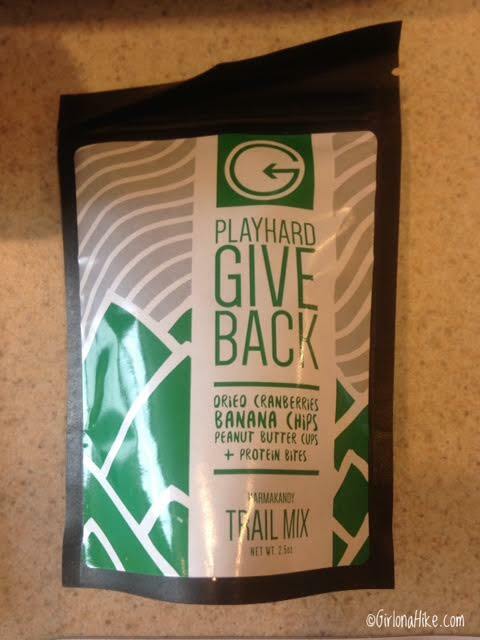 This small 2.5 ounce bag packs in 330 calories, 20g fat, 12g fiber, and 7g protein. The dried cranberries and banana chips give the mix a nice chew and sweetness, while the peanut butter cups make my mouth water after a hard hike or ski. 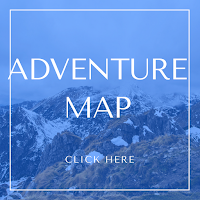 The KarmaKandy Trail mix not only fuels your adventure, but also donates 5% of the revenue to help provide opportunities for others to giveback through volunteer programs. It's a #snackwithpurpose! I LOVE utensils! Every time I head out to backpack, I seem to lose my previous set, and I end up finding all of UL utensils in my gear room. So when I saw these bad boys, I was pretty stoked. You just can't go wrong with a shiny new fork and spoon for the next adventure. 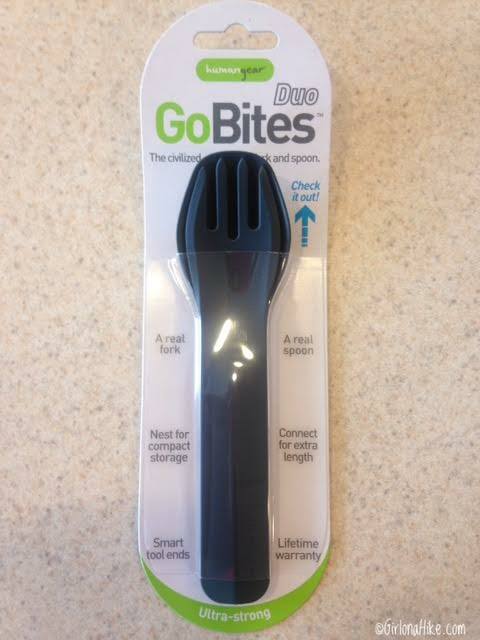 What I absolutely love about this GoBites set, is that the fork and spoon connect to create an extra long handle. Having a long handle is a great feature for me, since I mainly use Mountain House meals for backpacking. Digging your hand into the food pack can easily get your knuckles messy, but with a long spoon there's no need to worry about a mess. 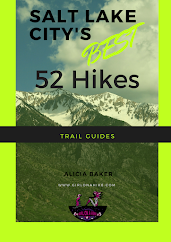 Not a fan of backpacking? Use these in the office, on a road trip, for your kids, or even on a picnic. Weighing in at only 0.8 ounces, this GoBites Duo set can easily fit in your purse or your back pocket. They are made of extremely durable nylon, are BPA-free, PC-free, and phthalate-free. You can purchase GoBites on Amazon. When I saw this item, I wasn't too excited. I've owned many jackets over the years and have never had a zipper break. Zippers haven't even broken on my outdoor gear. 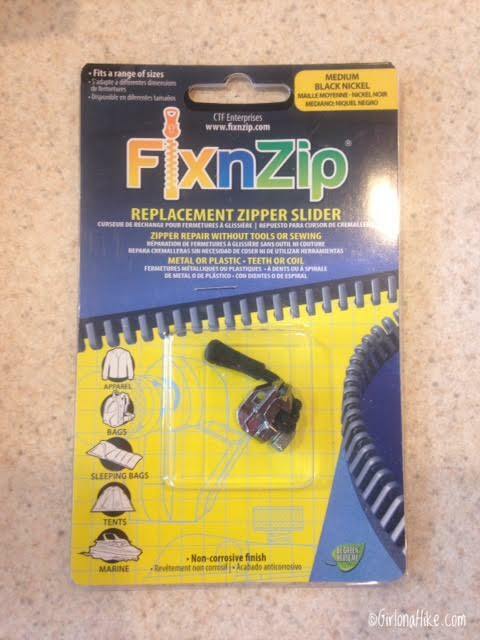 However, that one time it breaks I will be ready to go with a FixnZip Zipper Repair Kit. This zipper works on nylon coils, plastic and metal teeth, and can easily be used on both open and closed-end zippers. Now you can dig out that old sleeping bag, tent, or pack and bring it back to life. 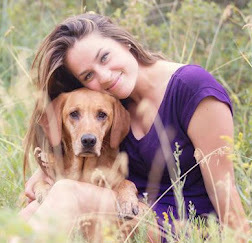 Be sure to follow Cairn on Twitter, Facebook, Pinterest, & Instagram! So do you think it's worth it every month? Really cool! I have seen these and have always been curious! 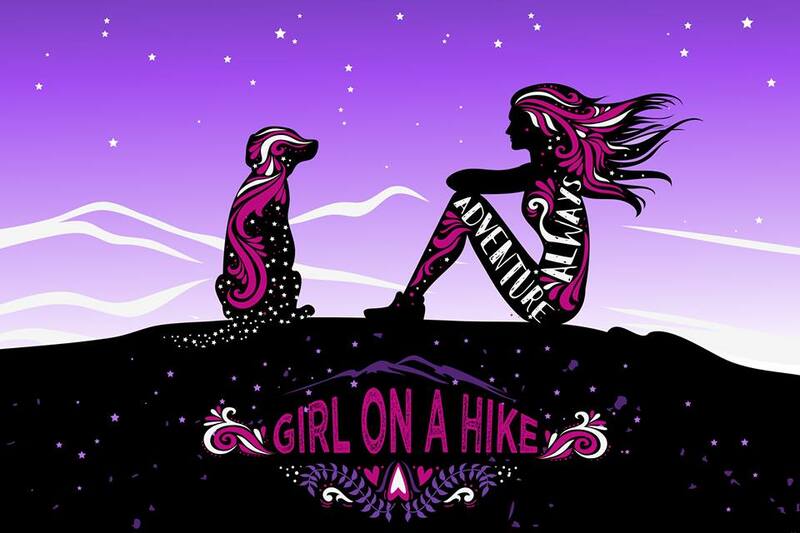 I am not sure I would do it every month as the cost could add up (even though its a great deal) but I could see this as being as AWESOME gift for someone who loves to hike and for a once in a while thing to get a fun box and new ideas. Ive done monthly subscriptions before, one for makeup and one for running stuff and I always enjoyed the products. Thanks for sharing!